Our new buddy Will happened on an Opel party somewhere in the Golden State, where a group of classic Opel GT owners got to eyeball GM's Germanic B-car, the Astra — in hatch and retractable hardtop versions. As you know already, the Astra will be coming to the US as an entry-level Saturn sometime later this year. Well, dunno what happened. It was only a one-day gig. they had a meeting of "classic" Opel GT owners (who knew??) 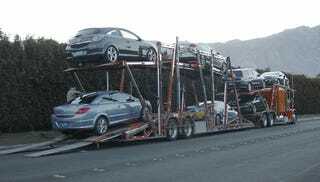 there this am, and then this pm, they loaded the new Opels onto the transporters. I asked the truck drivers "where to?" and they said "San Diego" I'll keep my eyes peeled.